Global Gas Water Heater Market size for 2016 was valued over USD 8 Billion and is set to exceed 30 Million Units by 2024. Government mandates toward adoption of energy efficient products along with increasing demand for replacement of existing heating systems across North America and Europe will augment the gas water heater market size. Advancing product efficiencies along with growing concern towards reduction in cost of energy and standby losses will further positively impact the business landscape. In 2017, Government of Canada implemented the federal Energy Efficiency Regulations 2016 repealing the existing regulations. The amendment aims at increasing energy efficiency standards for consumer products and further harmonizing Canadian standards with that in the U.S. Rapid urbanization coupled with rising demand for tailored products subject to end-use applications will stimulate the gas water heater market. Developing economic scenario on account of rampant commercialization and residential establishments will boost the product demand across Asia Pacific region. The National Gas Utilise Policy by the Government of China implements standards and consumption codes to track and secure residential gas use for water heating and cooking purposes. Strong economic factors including initial costs and payback periods will positively influence the industry landscape. Ongoing technological advancements including digital temperature control and electronic thermostats coupled with increasing emission control measures will foster the gas water heater market growth. Extreme climatic conditions along with rising concern towards energy conservation will further complement the industry outlook. In 2017, General electric launched its Geo Spring Hybrid Water Heater in collaboration with Department of Energy (DOE). As per DOE, the product is projected to consume 62% less energy when compared to standard 50-gallon water heater. 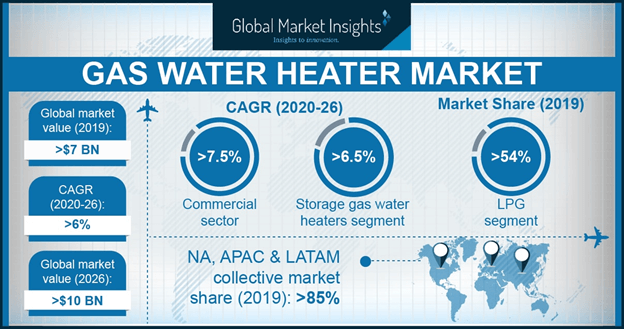 Storage gas water heater market is predicted to witness growth over 1% owing to lower initial costs and ease-of-replacement when compared to their counterparts. The product integrates pre-heating and holding capacity which further amplifies its penetration pertaining to the availability of optimum warm water quantity. Tankless in 2016 accounted for over 75% of the global gas water heater market share. Durability, longevity, endless supply, and comparatively small size are some of the imperative parameters which will embellish the business growth. Developing regions across Asia Pacific, the Middle East &, Africa, and Latin America will witness higher product penetration owing to rising demand for lower standby losses and cost-effective products. Residential gas water heater market size is set to exceed 27 million units by 2024 pertaining to ongoing residential establishments across developing regions including India, Brazil and Mexico. Rising investments across real estate sector and refurbishment of existing conventional infrastructure in regions including the U.S., Russia and China will foster the business outlook. In 2017, Blackstone and Saudi Arabia’s Public Investment Fund have agreed to collaboratively invest USD 40 billion towards residential and commercial infrastructure projects in the U.S.
Commercial gas water heater market share is predicted to witness growth over 3% by 2024. Increasing investments towards development of energy efficient, cost-effective products coupled with government initiatives towards curtailment of emissions will further augment the industry share. Technological integrations toward hybrid and flexible heating appliances will further fuel the product demand. The U.S. accounted for over 70% of the North America gas water heater market share owing to ongoing replacement of the traditional heating systems. Increasing adoption of customized products along with smart control heating facilities will positively influence the business landscape. The Building America program introduced by the Department of Energy to ensure energy efficiency across residential buildings will positively influence the product demand. Spain gas water heater market is set to witness growth over 1% by 2024. Advancing heating technologies and environmental constraints across the country will foster the industry landscape. As per the European Commission, technological progression subject to smart control heaters and water level standards are to be maintained under the labelling and eco-design directive. Rising concerns toward emissions during the use phase of products and better product life expectancies will further complement the industry potential. China gas water heater market is projected to exceed USD 1 billion by 2024. Rapid commercialization and residential establishments pertaining to advancing economy will stimulate the industry outlook. Rising demand for energy efficient heating systems coupled with increasing consumer awareness towards emissions will further boost the product demand. High-end research initiatives toward the development of energy efficient and cost-effective appliances are the prominent strategic measures adopted by the leading industry players. The industry has witnessed intense competition from its available counterparts over the years subject to low initial cost. 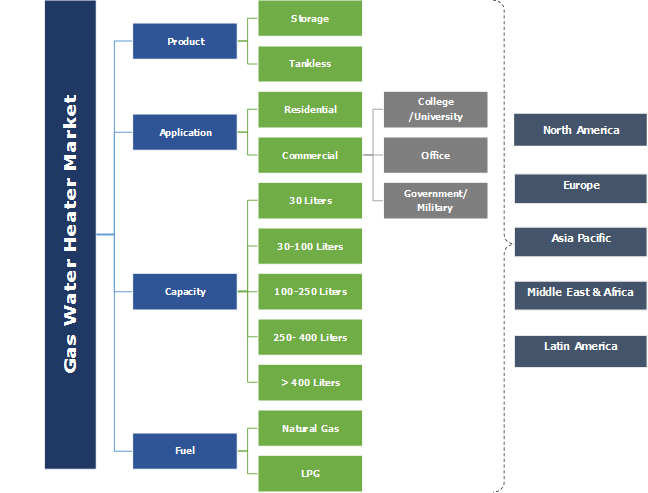 These products provide a continual supply of hot water and are also referred as geysers, calorifiers, heat exchangers, hot water tanks and heaters, and boilers depending on the region, and non-potable and potable applications across industrial and domestic establishments, and their energy source. Natural gas is used for heating and can be consumed directly or through generating electricity that, in turn, heats water.